If you’re at all familiar with the weather in San Francisco, you'd know that the months of June and July bring a rare chance of sunshine. However, the past few weeks west of the Bay Bridge have proven the legendary quote by Mark Twain ("The coldest winter I ever spent was a summer in San Francisco") to be a tad inaccurate for the summer of 2015. Tuesday, July 14th happened to be a perfect evening, as you could throw on a light jacket to peruse the streets of downtown San Francisco while looking up at a clear, fog-less sky. This is also the night that Fort Lean rocked the Rickshaw Stop with an intimate, dynamic performance. The Brooklyn-based, American indie-rock band, Fort Lean, released their first EP in April of 2011, including three singles and a video. Since then, they've released another EP in 2012 and their first LP, Quiet Day, in early 2015. Since the band’s formation, they've toured with talented acts such as We Were Promised Jetpacks, Bear Hands, Joy Formidable, and Surfer Blood. They've also popped up at music festivals like Waking Windows and SXSW. The Rickshaw Stop was the third stop on their tour of southwest America, playing alongside Chappo and Yukon Blonde. Rickshaw Stop, a former TV studio, is the perfect combination of a welcoming ambiance in an adequately small space with minimal in-your-face lighting; giving it a feel as if you are watching a show in the comfort of your own garage. 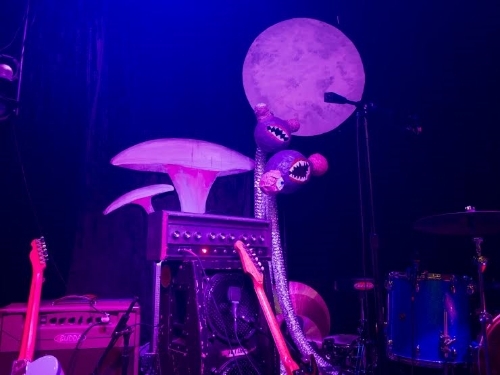 Prior to the show, the five members of Fort Lean were found socializing near the bar and blending-in with the few dozen fans, setting a comfortable, friendly atmosphere for the show ahead. The music from the venue's DJ slowly quieted as the group members nonchalantly took the stage, backlit with deep blue and magenta lighting. The crowd moseyed toward the band, leaving a few feet of space between the stage. Frontman/lead singer/guitarist, Keenan Mitchell, got on the microphone with a friendly, "Come closer!" As the audience closed the gap, the band broke out into their opening song, "High Definition" from their first EP in 2011, setting the bar (and energy level) high for the rest of the show. The ensuing keyboard solo by Will Runge caused the crowd's cheering to escalate as everyone clapped in unison to the beat. As the opening song finished, it was clear the night was going to be fueled by inexhaustible energy. Fort Lean continued the show with an assortment of new and old songs, making sure to bring the enthusiasm back up to its peak after their slower tracks. During "Do You Remember?” the crowd swayed back-and-forth together as Mitchell mesmerized the house in an emotional production. Each strum of the guitar-solo was felt powerfully, followed by several "Whooo!" shouts from the audience. In between each song, Mitchell would interact with the crowd, at times singling a person out, to make everyone feel like a group of old college friends. The strong bond between the guys of Fort Lean was obvious, on and off stage, and their enthusiasm was contagious. During long breaks in songs, they'd rock out and dance together, making sure to use every inch of space on the stage. As a song ended, they'd all take sips of their beer as they transitioned into the next track. This close-knit demeanor only made the audience feel more intrigued and contented throughout the show. 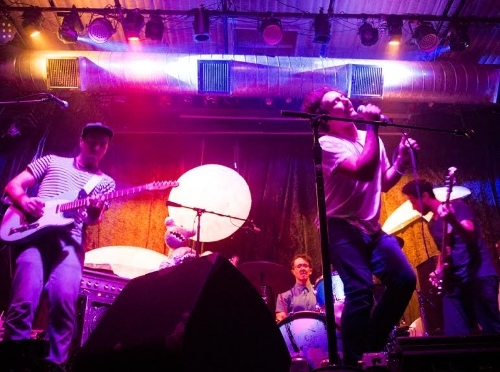 A noticeable crowd favorite was "Cut To The Chase," from Fort Lean's new 2015 LP, as it displayed a powerful performance from each member of the band. The combination of Zach Fried on guitar and Jake Aron on bass created a gripping tempo as the crowd shouted every word to this undeniably catchy song. The band wrapped up their set with a couple hits to seal the deal. "Dreams (Never Come True)" was the last of the slower songs and yet another emotionally charged one at that. Mitchell has a way of not only using his voice, but his body language to express the feelings behind a song and it almost locks you into a hypnotic-like state. But of course, when you think there couldn't be anymore jumping and dancing, Fort Lean performs "Envious" and gives everyone the most exuberant, impressive performance of the night. Sam Ubl exuded relentless energy on the drums the entire show, as he performed as if he could go all night during this track. Fort Lean capped off their set with the much-anticipated hit, "Beach Holiday" from their 2011 EP, giving the audience all the oomph they had left in them. It's nearly impossible to stand still during this quick, fired-up summer anthem. It proved to be a perfect ending to a lively and exuberant show. Although the performance was far too short, it was exceptional nonetheless, leaving the crowd clamoring for more songs to hear. The solos from each member were flawless, the energy was endless and each person in the audience was left with ringing ears and an infectious smile.